It has become an annual tradition that, in late January/early February, we invite Chris’ parents over for a weekend of celebration. Their birthdays fall in these two months, so we pick a date between them and go out to dinner and a Broadway show. An indulgent breakfast is enjoyed the following morning. This tradition has become known as the Birthday Weekend Extravaganza, and it’s something that we all look forward to every year. Since birthday celebrations aren’t quite complete without cake, I also make sure there is one waiting and ready when we arrive home from the show. This year’s cake was a repeat of last year’s, at the request of my mother-in-law—a request that I must say that I was more than happy to honor. This Cardamom Coconut Cake is one of my favorites. I wrote the recipe last year specifically for the BWE. The cake, however, wound up making appearances at family and other social gatherings all throughout the year. It can be hard to find an excuse to make cake, but this one has such a unique way about it that it almost requires a different dessert category altogether. For the finishing touch, I concocted a softly sweet, vanilla bean speckled, mascarpone buttercream. A regular vanilla buttercream or whipped cream frosting would work as well, but if you’re making it for a special occasion the vanilla bean really adds something wonderful. Plus, you can use the leftover bean as a simple, lovely garnish. And if you like the sound of this cake but don’t have a celebration coming up, you can make a casual version by halving the recipe. Serve the single-layer slices with a dollop of lightly sweetened whipped cream. It’s perfect for breakfast, or as an afternoon snack, with a cup of coffee or tea. Preheat the oven to 350 degrees. 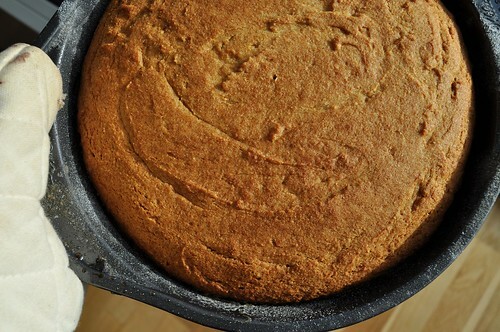 Grease two 9-inch round cake pans with coconut oil and dust lightly with rice flour. In a medium bowl, whisk together the coconut flour, sorghum flour, rice flour, potato starch, xanthan gum, baking soda, baking powder, cardamom, and salt. In a large bowl, cream together the coconut oil and the honey. Add the eggs one at a time, beating well after each addition. Mix in the vanilla extract and the water. Add the dry ingredients to the wet ingredients in two additions. Mix until fully incorporated and the batter is completely smooth. Divide the batter equally between the two prepared cake pans and bake for 35 minutes. A toothpick inserted into the center of the cake will come out clean when done. 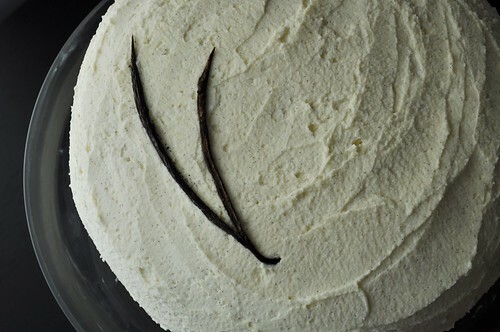 Split the vanilla bean down the middle lengthwise with a paring knife. Spread the halves flat (cut side up) and drag the blade of the knife down the length of the bean to scrape out the seeds. Reserve seeds. In a large bowl, beat the butter and mascarpone together until fluffy. Add the vanilla bean seeds, vanilla extract, and confectioners sugar and blend until well incorporated. While beating, slowly add in the heavy cream. If your mixture begins to curdle, it has gotten too cold. Place a bowl of warm water under the bowl that your frosting is in and beat until it begins to soften and smooth out; remove the warm water. If it goes too far and begins to melt, refrigerate for a couple minutes, or place over an ice bath, until it comes back together. The frosting is done when all of the heavy cream has been incorporated and it is smooth and creamy. 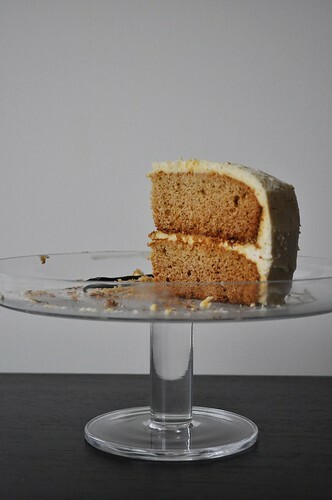 TIP: If making the cake in advance (or for leftovers), store the frosted cake in the refrigerator. Be sure to remove from the refrigerator an hour or two before serving so that it can come back up to room temperature. The coconut oil will make this cake dry and crumbly when cold, but it becomes moist again once the chill is gone. Unfrosted cake can be stored, wrapped in foil, at room temperature.